Everything you need to do the powerful Christianity and Islam study all on one CD Rom -- the 359-frame POWERPOINT TEACHING FRAMES, printable pdf files of the 56-page POWERPOINT GUIDE in both color and grayscale, a printable pdf file of the 80-page STUDENT BOOK, and a printable pdf file of the 100-page LEADER'S GUIDE. 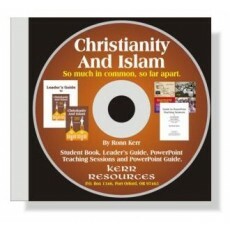 All of the Christianity and Islam resources on one CD Rom! In addition, the 56-page PowerPoint Teaching Guide, which supports the 356-frame Powerpoint program, is on the CD Rom in both a printable color and grayscale pdf version with pictures and commentary about each frame of the PowerPoint shows. And, the CD Rom also contains printable pdf copies of the 13-chapter, 80-page Student Book and extensive 100-page Leader's Guide.